Click the logo for a wikiSoldat mirror. Running Soldat 1.7.1 on macOS (High Sierra) Tutorial by aveh. The setup might not always be such straightforward, and Mac-specwise, Wine -version may need to be different in some cases. Making changes through PlayOnMac UI is rather simple and user-friendly. Launch and install the program. 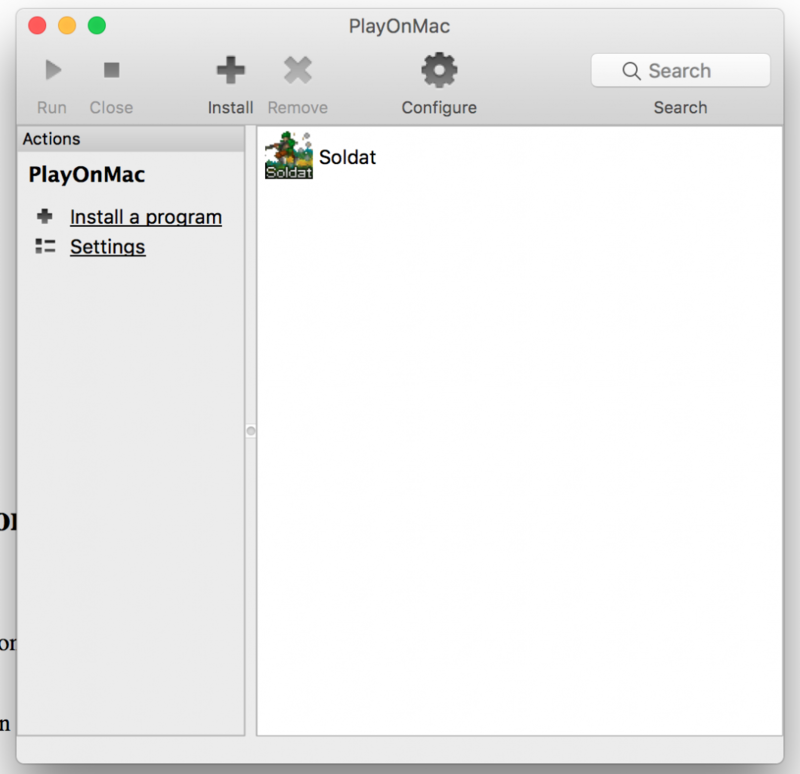 Inside PlayOnMac click Install a program, and search for Soldat. It will start installing dependencies, click on Install on these. Then It'll automatically download SoldatSetup.exe from soldat.pl and begin Soldat installation automatically. During the installation click next (do not configure anything on this step). Install to default path is C:\Soldat (do not change). Wait for the installation to finish and then edit Config.exe to the preferred options for your setup. 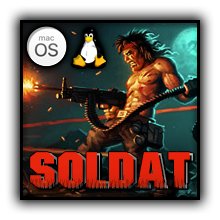 Open Soldat only through the PlayOnMac interface instead of the automatically made desktop icon. To remove mouse acceleration and make mouse feel "Windows-like". PlayOnMac instructs to install XQuartz (instead of using X11), this might cause in-game lag (it will ask every time you open PlayOnMac, just ignore it). To edit taunts.txt / soldat.ini to your personal preference, open PlayOnMac, secondary click on Soldat and select "Open the application's directory". This will open the Soldat directory. Running Soldat 1.7.1 on Linux Tutorial by SyavX (XvayS). Fairly similar to the steps for macOS, but with PlayOnLinux. However, it might be necessary to enable Video Compatibility in Config.exe in case the visuals are not loading properly, or getting an "Access violation" error after entering the game. In order to open config.exe you'll have to click on the Soldat application configure button, and there switch to "Other"/"Misc" tab, then click on "Run .exe on this virtual drive". Inside config.exe go to "More" Tab and check the video compatibility box.